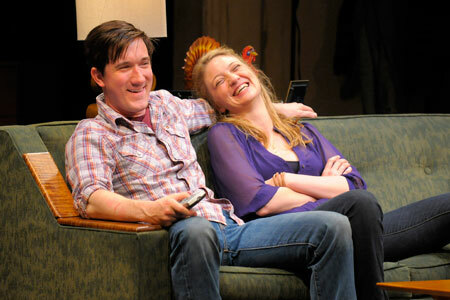 At Berkeley Rep, Carson Elrod and Heidi Schreck (right) star in the world-premiere production of In the Wake, from the creators of Broadway’s Well. Well, it's closed now but on Saturday afternoon "I saw In the Wake" at Berkeley Rep. Lisa Kron's new play is poised to perhaps be one of the greatest plays of our time. With a little cutting and a little bit of work in bringing together the main story, and the background story of our country's downfall during the Bush years, this play will surely be a huge hit in New York and will bring on the attention of the Amercian Theatre Wing. Not in a long time has a play so absorbed itself into my consciousness. The day after seeing this show I felt incredibly down and hopeless. The message at first seemed so fatalistic. But as I thought about it more,I realized that it actually was a play about finally understanding oneself after hardship and heartbreak. I think that this play may win the Pulitzer Prize for Drama. It's headed to New York this fall. What can you say, another great one comes out of Berkeley Rep. You have got to love that.